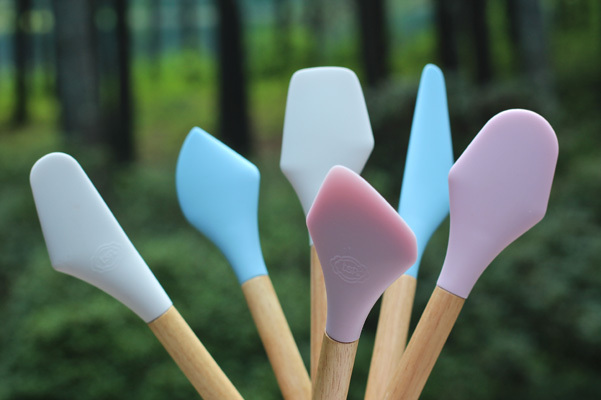 The spatulas are made from heat resistant silicone to 440°F and are BPA free & dishwasher safe. 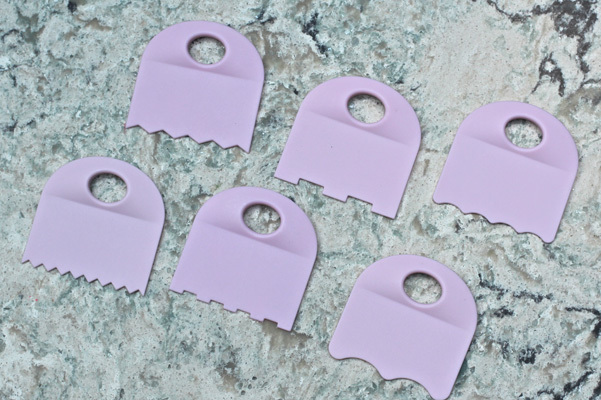 The combs are made from nylon and are BPA Free & dishwasher safe. Test Kitchen Overview: We were sent a PR email featuring these products and as soon as we saw the images of the spatulas, we had to get our hands on them. We use our spatulas all the time – for folding, mixing, scraping out jars, spreading – whether it is buttercream, frosting, ganache, peanut butter, honey or even when we are savory cooking like folding together the ingredients for our weekly gigantic kale salad that we snack on all day (one cannot live by butter and sugar alone). We asked to see the spatulas and the icing (decorating) combs to take into the Test Kitchen. 16” Freesia Spatula: This is the extra long skinny one (blue towards right rear). We did find that it worked great for getting the last bit of ingredients out of jars, but was too narrow for folding. This is why there are so many various shapes – they each serve a purpose. 14” Calla Lily: This shape (far left in image) was a little more similar to other spatulas that we have but the sharp angle on the side gives it some flexibility; it not only worked well for folding small amounts of ingredients, but that little bump-out helped scrape out jars and the bottom corner of bowls. 14” Tulip: This shape (rear, middle, white) was very multi-functional and the squared off top works well with bowls that are not completely rounded on the bottom. 14” Peony: If we had to choose one that would be fairly multi-purpose, it would be this one (far right, pink). 14” Orchid: The rounded side is good for folding and scraping bowls, while the straight side works well for smoothing the tops of batters (2nd in from left, blue). 14” Lotus: This one is an odd shape and at first we couldn’t quite figure out its best usage (front in pink). Then, while using it with a food processor, we found that the pointed end got into the corners of the bowl perfectly and now we grab it just for this usage every time. Icing Comb Set (6 combs): The icing comb set has nicely formed ridges for creating various textures in buttercream and icing. 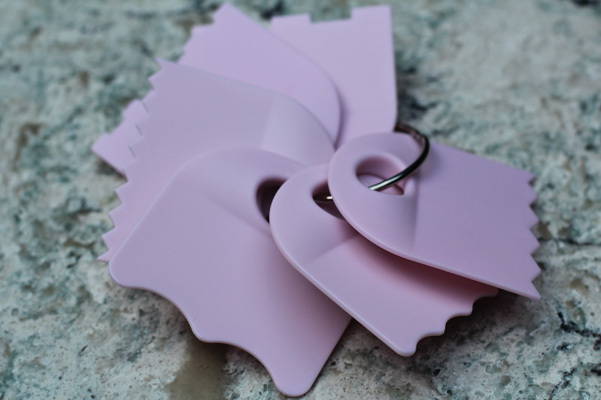 They are a good stiffness, attractive and easy to use and clean. The shapes are as follows: Large Zig-Zag; Small Zig-Zag; Large Stripe; Small Stripe; Large Scallop; Small Scallop. Pros: The spatulas add a decorative flair to the kitchen and they do work quite well and clean easily. These new shapes add function to our battery of tools. The combs worked well. For the quality we find the products to be very well priced. Cons: The 16” spatula might be a challenge to stand up in some dishwashers (simply lay it down). We like the pink color of the combs, but wonder if that will detract for some bakers. Suggested Use: We love that the spatulas are named after flowers and couldn’t resist arranging them like a bouquet. These would make a perfect wedding shower gift. 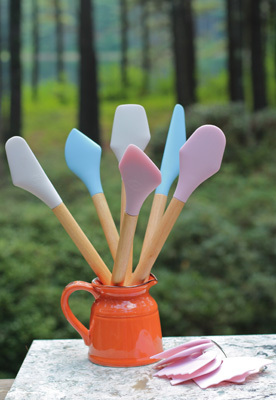 As with any rubber/silicone spatulas, we say you can never have enough!